The new normal is a roller coaster of one bubble bursting after another. Neural networks are computer systems inspired by an animals’ central nervous system that is capable of machine learning and pattern recognition. Neural networks can be very powerful systems for identifying and classification of things. If we are developing neural networks to categorize and recognize patters we necessarily have to teach it what a pattern looks like. A simple way to understand is to think of letters in the alphabet. The first letter of my last name can appear very different, depending on what font we use. You can probably see how a program designed to recognize the pattern to classify a letter would necessarily need several variations – a range of possibilities. In other words, if it required perfection and we defined the perfect “S” as the first one, it would miss the other two. I use this as an example for common errors in identifying and classifying chart patterns. Not all price trends unfold the exact same way, so there is some subjectivity about identifying and classifying them. If we required them to be too exact, we miss those that aren’t. But patterns don’t always play out as expected, either. Just because the stock market index broke out to a new high doesn’t mean it must continue its inertia in that direction. It’s probabilistic, never a sure thing. We the people have trouble with that – people hate uncertainty, even though that’s all we ever have. Now that we’ve added some tolerance to our thinking for a moment, let’s take a look at an interesting chart someone passed along in my inbox recently. Below is the S&P 500 stock index from the HS Dent Foundation. Harry Dent probably needs no introduction. As you can see, he has labeled the chart to classify the peaks and troughs with A, B, C, D, and E. At this point, the price trend is at the “E” stage. He draws a dotted line that shows the trend eventually reversing down from a higher high at “E” to a lower low, which I guess will be labeled “F”. That’s why they call it a megaphone. What happens after “E” is not yet known, but you can probably see the line of thinking. HD: Investors must realize that there is a new normal. Stocks will not be growing at 12%/year. Bonds will not yield 5–6%. The new normal is not even the expectation of 4% on stocks and 2% on bonds that people like Bill Gross from PIMCO suggest. The new normal is a roller coaster of one bubble bursting after another. Investors have to get away from the traditional concepts of diversification and asset allocation for the next decade or so. When bubbles burst, everything goes down. In 2008, real estate, oil, commodities, gold and silver crashed. The U.S., European and emerging markets crashed. With each bubble, the market has gone to a slightly new high and to a slightly new low when the bubble bursts. 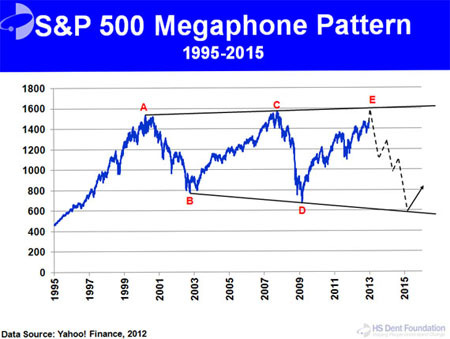 We call it a megaphone pattern. “The new normal is a roller coaster of one bubble bursting after another” isn’t as much a prediction as it is a reality, as evidenced by the actual history of the chart. The problem is, it seems, according to Dent the peak at “E” was supposed to play out in 2013. So, many people now criticize his forecast. Someone asked what I thought about it, so I’ll share two things. 1. He was wrong in his precise prediction that this top would be 2013. We can only say that because 2013 has passed. The problem with predictions and forecasts such as this is that no one really knows for sure what’s going to happen next, much less the precise date. Even if it were probabilistic based on sound logic and math, which implies there is some chance it may be wrong. 2. What I like about the chart is that it can be useful as a reminder to actively manage risk. What if it does play out that way? Because of #1, it may not be wise to exit to 100% cash and wait for it to happen – it may not. Instead, you may use it as a motivation to know what you’ll do if that does play out. If you do nothing at all, how will a -70% decline in stocks impact you? Will you have time to wait for the 233% gain required to recover the loss? When would that be? If you wish to instead avoid such a decline, how will you do that? Such declines don’t go straight down quickly, but usually more of series of advances and declines making it very difficult to navigate. For example, -10%, +8, -15%, +9, -20%, +17%, etc. Every time it moves up, people get excited and wished they’d picked the bottom. If they get in, and it reverses back down, they are in a loss trap again. When they are down even more, they panic out, it reverses back up, they wish they were in. If they are a new portfolio manager with no prior experience in such a period, they’ll have investors feedback coming in with the wrong sentiment at the wrong time. If you are unsure about what I mean by people oscillating between the fear of missing out and the fear of losing money, you’ll understand after you experience it if this chart plays out. I’m sure he provides all kinds of fundamental and economic reasons for why a new low for stocks could be reached in the years ahead. Those things can have the power to convince you if it will happen, nor not. What you believe is always true for you. Let it serve as a reality check for the current stage U.S. stocks may be in if you find yourself feeling giddy like the crowd. My focus is on a range of possibilities and being prepared with systems designed from experience to deal with them, not just hypotheticals and back-tests. It doesn’t matter if it will happen, it only matters if it does. And if it does, how we respond to it is what creates our own outcomes. The thing about patterns is they don’t have to be perfect… just because one person expects it to be Arial doesn’t mean it won’t be Century Gothic. great post mike. there is always a tendency to find evidence that supports our decisions. the future cannot be certain and if it does play out the way we “thought” it would then there is a outcome bias that tricks people into thinking that the process is always correct. when in fact the next time it may not… the good new is it doesnt matter if you have systems that adapt to change.